Kareem Wells wears a lot of hats. He is a businessman, a performing artist, a motivational speaker, a husband and a father. He's also an advocate for public education, having recently earned his G.E.D. years after dropping out of high school. 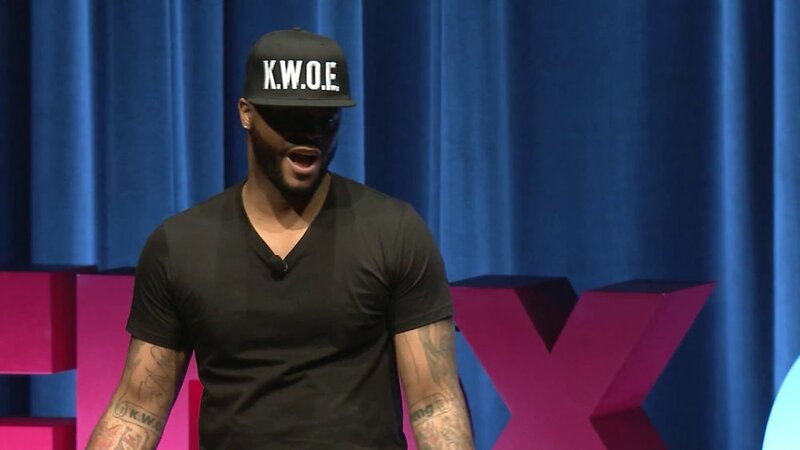 But there's one that he wears that is, literally, a hat - a stylish baseball cap emblazoned with the letters "K.W.O.E.." this acronym is both his nickname and his quest for a life filled with purpose. "Kareem Wells of Excellence"-or K.W.O.E. - uses his life experiences to inspire and provide hope to youth in Chicago and across the nation. He stands out in hip-hop and on Chicago's west side - two places to often defined by violence and drugs - and a "hope-peddler" leading you to a new way of thinking and living. We had a chance to sit down with K.W.O.E. to see how he plans to continue to impact the world through his art and community-building work. VOYD: How did your experiences growing up in Chicago shape your music and career? K.W.O.E. : I came up on the city's westside - a community of close families and neighbors who cared, but also streets where gangs and drugs had a pull for young men like me. I had to hustle to stay one step ahead of a lot of bad things. I was fortunate to have had a couple of men in my life who say my promise and not just my problems. Their guidance led to me tap into my love for music and dance. My mentor, music producer Ivan Dupee, saw my excellent work ethic - something I used to apply to the streets - and so he taught me how to apply it to the music studio. Growing up in Chicago prepared me to write and perform the kinds I do, and to run a business that employs the type of young people I used to run with - people with promise who need opportunities. VOYD: You truly lived the street life, what made you decide to get away from it? K.W.O.E: Everybody meets at least one fork in the road - that thing that happens when you can decide to go one way or another. That was my experience. I had been straddling the line between the streets and working on my music. One of the older guys from my neighborhood who always looked out for me saw something more significant for my life and pushed me to do more with myself. I chose that path. He moved me out of the neighborhood, to an environment where no one knew me, and I got a job and began to pursue my music. VOYD: We heard you are working with Chicago Schools. What are you doing with them and what are your plans for the future? K.W.O.E. Through my nonprofit, K.W.O.E. Hope Foundation, I have been partnering with Chicago Public Schools to provide motivational talks to students. I hare my story, which many of them relate to, and I have fun with them, mixing in music and performances with Level Next Music label mates. We spread a message of hope and drive home the idea that with perseverance they can overcome any obstacles they may be dealing with. In the future, I see us doing more of these events in and outside of schools, and for adults. For example, we visited Illinois Statesville Prison this spring, and late last year, hosted students at WLS-AM studios. VOYD: In the day and age of social media trolling. How can you help guide these kids from turning to violence? K.W.O.E. : That's a heavy question. I'm a voice, but I'm not the only voice. My visits to schools have taught me that these kids have a lot to say, and a lot of promise - they need to know that people like them-people like me-can achieve success when they use that voice, as opposed to keeping quiet. I show them that I use my voice in a lot of ways - on the mic, in the office, through my lyrics. And so I hope that I am encouraging kids to find and use their voices as a means to change the world, rather than using instruments of violence. Put simply, put the guns down and pick up a microphone or a turntable or whatever it is that gives you joy and power. "I'M A VOICE, BUT I'M NOT THE ONLY VOICE." VOYD: How can people keep up with what you are doing next? K.W.O.E. : I have so much going on this year and next, that the best thing I can say is to follow me on social media to keep up, and to let me know where I should take my message. I want to hear from people who have ideas-tell me where there are people who need to be motivated by my story. I'm listening. Always remember, "Dream Big," "Never Give Up" and "Always Give Back."